Some impulses ought not be resisted. 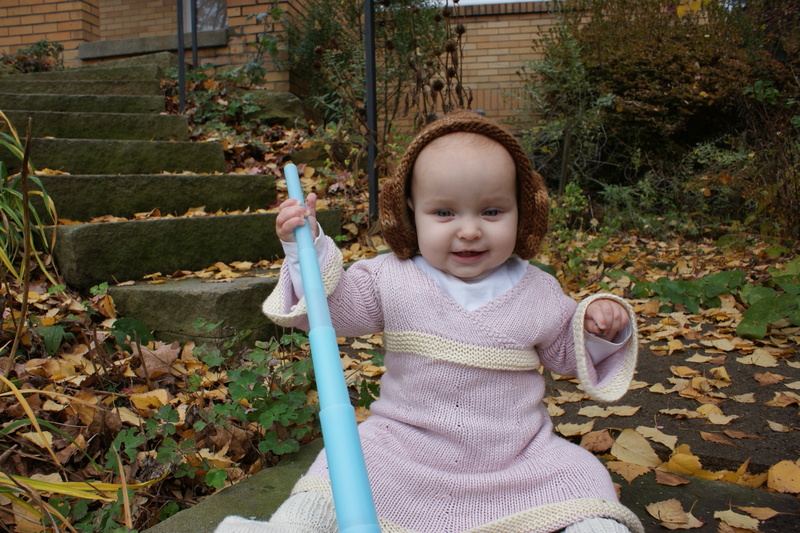 Like, when you realize you accidentally made your baby a Jedi dress, deciding three days before halloween to make her a Princess Leia hat. 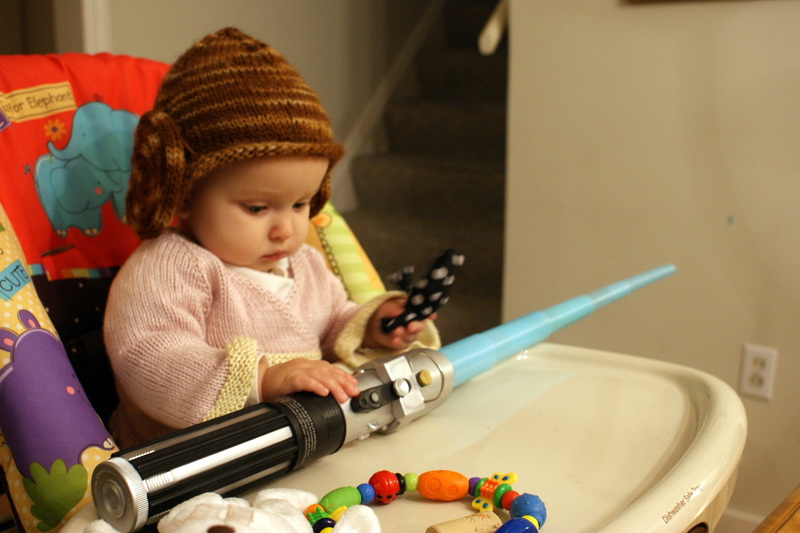 I think of this as an alternate universe Leia – one in which Luke is the one who grows up a senator’s child, and Leia gets taken under Obi-Wan’s wing and inherits her father’s lightsaber. When she’s a baby. You know. 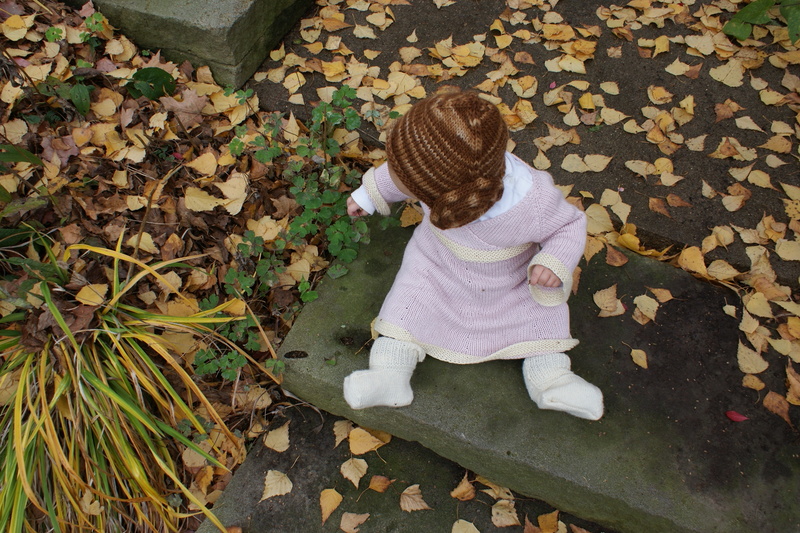 Pattern Review the first: The hat is an adaptation of Elizabeth Zimmerman’s Ganomey hat – re-knit about three times until I succeeded in making it actually shaped by a small human’s cranium. Add on a whole lot of I-cord, and voila! Danish head. 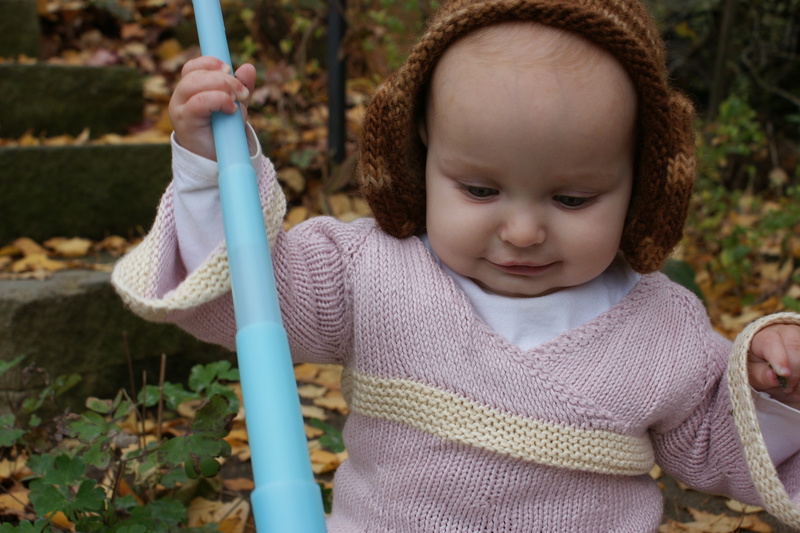 A word to the wise: the Ganomey hat as written in the original Knitter’s Almanac will fit about a 6-month-old baby’s head, but she doesn’t actually say that anywhere in there. And it won’t look like this. I think it was originally meant to be a sort of long sleeping-cap type thing. 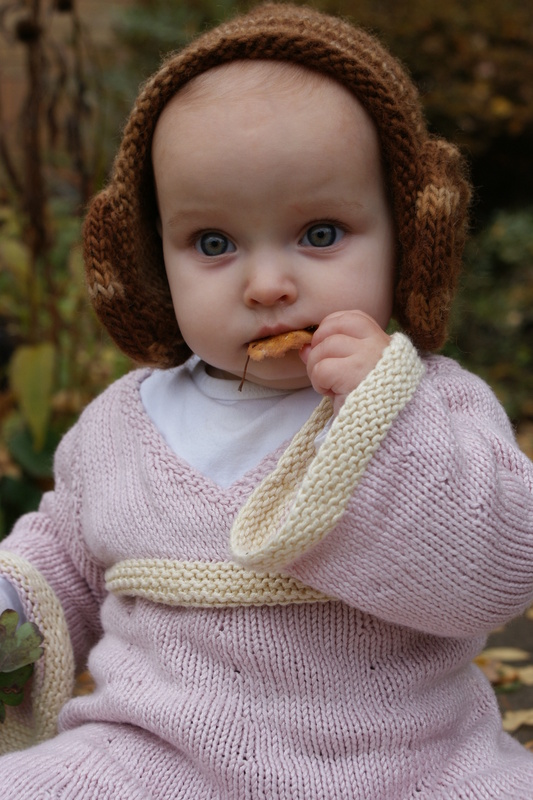 I don’t know if it’s been updated for the new edition of the Almanac, and there appears to be a user-revised version of the pattern for sale on ravelry that I cannot vouch for. This is my own un-vention, to use EZ’s term, and I wish you the best of luck exploring the options yourself. 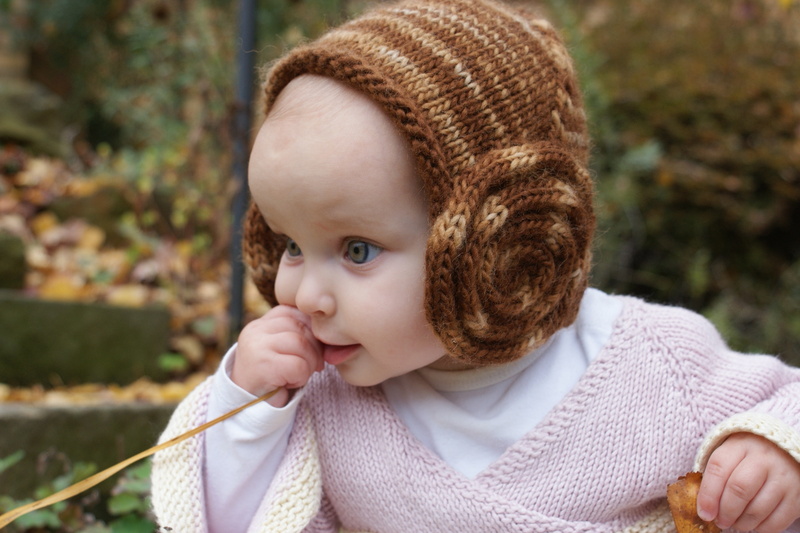 I chose it because hidden under those cinnabuns are mitred earflaps, which I always thought were rather brilliant. The yarn is my own, hand-dyed in black walnut brown, in a sample of a Kraemer base I decided not to get. I know I should have used a solid color, but see above on short notice. Pattern Review the second: The dress is Oriental Lily by Georgie Hallam. The pattern is free, and it’s an excellent one – about a bazillion sizes, and so much detail. This is my second baby dress by Ms. Hallam, and I had picked them both out before I realized they were by the same person. That must mean I’m a fan! Anyway, Do Use Your Own Judgment when it comes to dress length. She gives measurements, but I’m still not sure what they are referring to – total length? Length from armholes? 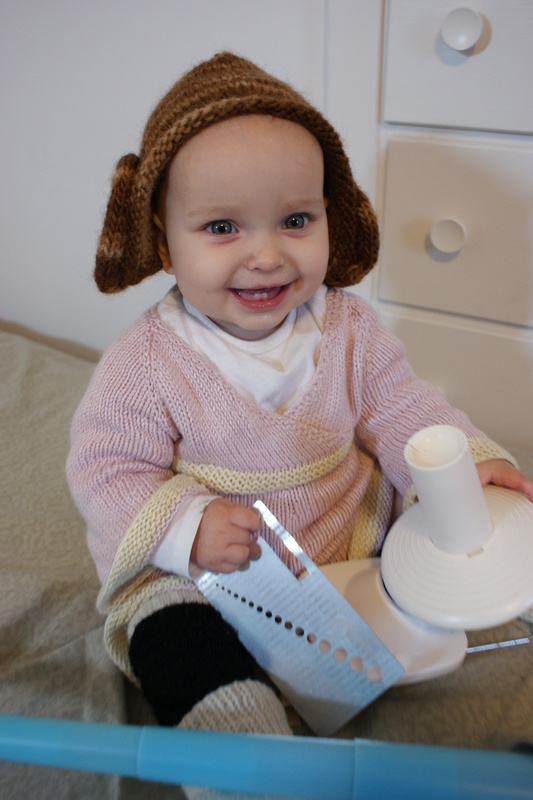 Anyway, this dress is too long, but little Leia isn’t going to be crawling in it, so I’m not bothered. It wasn’t meant to be a costume, just a way to use some beautiful bamboo/silk yarn given me by a friend. 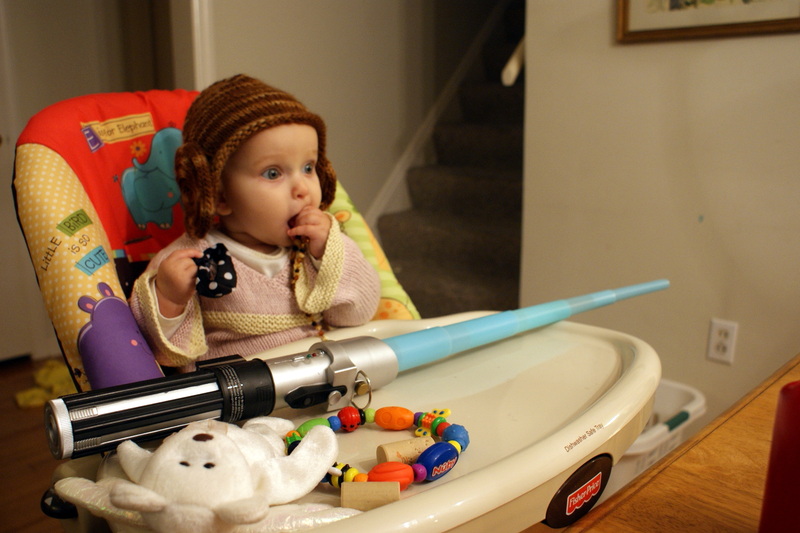 But after putting it on her, Jared and I both independently exclaimed, “She looks like a baby Jedi!” So this had to happen. What I am bothered about, though, is the fact that my baby Naomi is suddenly eight months old. Eight months and a week, to be precise. She still can’t quite get herself crawling; in fact, when I make her try, she sort of moves backwards a bit before giving up in frustration. But she is getting her own ideas about motion nonetheless. She finally rolls around, climbs all over me, finds her own ways of reaching what she wants, and sometimes genuinely prefers sitting on the floor to the couch. But now, of course, B is totally last week. I can’t even get her to say it. Everything is “da da da da da” now. Typical. She wasn’t in a very smiley mood for our photo shoot. Maybe because I usually don’t let her that near all the very edible-looking fallen leaves which have captured her very focused attention. But I got one from my little stinker a little later. We spend a lot of time up in the wool room these days, me spinning for Sweetwater (more on that another day) and she playing with all the exciting toys I keep up there. Oh, my pretty little stinker. In bed now, dreaming of lightsabers, leaves, and needle gauges. I can’t wait to see what crazy ideas of your own are locked up in that brain. But that will mean growing up! So just kidding. No rush. I can wait. I love her outfit! And that 3rd picture is my favorite. Something about her pose and the way she is positioned in the picture….it’s priceless. 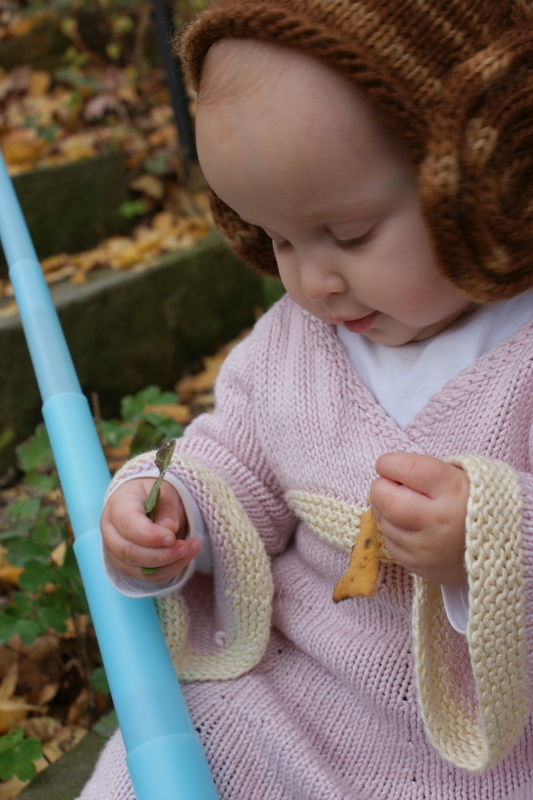 Christmas present hint: framed and printed picture of Jedi Naomi studying leaves? Haha hint taken! It’s funny; she’s not very smiley, but these pictures give a different look at her little face. I love them.